A world-first biogas capture project is paying big dividends for Darling Downs red meat processor, Oakey Beef. Completed in late 2014, the far-sighted green energy initiative made by NH Foods Australia at its Oakey processing facility west of Toowoomba is helping moderate energy costs, delivering lower cleaner wastewater effluent, and reducing the business’s fossil fuel environmental footprint. The project is based around a Covered High-Rate Anerobic Lagoon (COHRAL) facility designed and constructed by Australian environmental engineering and green energy company CST Wastewater Solutions. 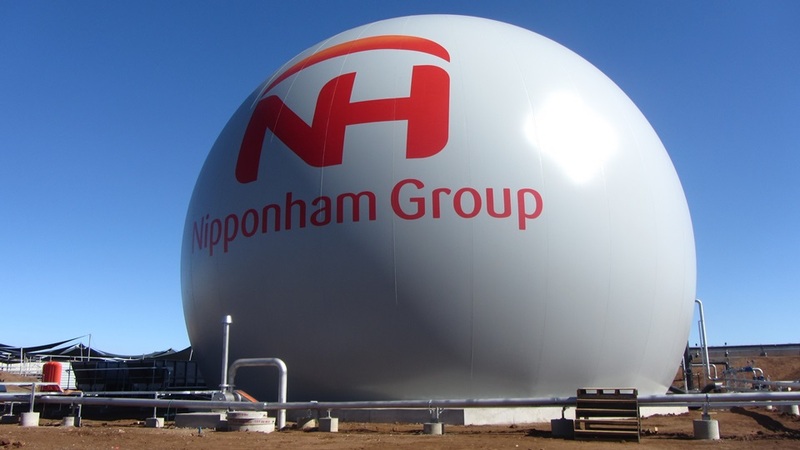 The project’s defining feature is an enormous inflatable sphere capturing biogas (pictured), visible from kilometres away along the nearby Warrego Highway. The project is designed to produce biogas (primarily methane), which is stored for use in the 6000 cubic metre flexible PVC-coated polyester storage balloon, from which biogas is drawn to fuel the boilers. The installation continuously produces 3000 to 4000 cubic metres of biogas each day, depending on the level of processing plant throughput. An independent analysis of regulatory and related costs in red meat processing commissioned by the Australian Meat Processor Corporation last year showed that energy costs were much higher in Australia than in the US, Brazilian or Argentinean processing industries. 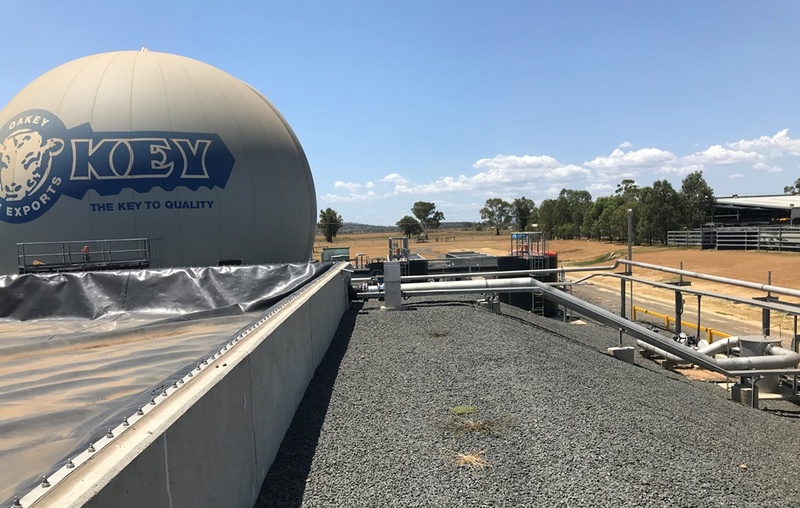 Developer and project manager CST Wastewater Solutions recently completed a maintenance inspection of the Oakey biogas capture project, as it approaches its fifth year of service. It found the plant to be in “outstanding condition”, having required only routine maintenance over that time. The biogas generated through the facility is used to fire the plant’s existing boilers, replacing natural gas. This leads to replacement of fossil fuels and greater cost-efficiencies at a time when energy costs are in an upwards spiral. The anerobic digestion plant extracts green energy biogas from Oakey’s wastewater streams, potentially replacing millions of dollars worth of natural gas over its operating life. Instead of effluent being stored in energy-costly and extensive aerated lagoons traditionally used by food and beverage businesses – with associated environmental, water and odour issues – waste at Oakey is converted to biogas by a clean, green and reliable anaerobic digestion process. The process is applicable to any food, beverage or primary processing plant with an organic waste stream. The Covered High-Rate Anerobic Lagoon (COHRAL) design at Oakey occupies half the footprint of comparable covered anaerobic lagoons, and is much more space-efficient than typical energy-hungry and odour-producing open aeration lagoons in use in older systems at processing facilities. The pre-treatment of wastewater prior to entering the COHRAL system also leads to better recovery of valuable protein and fats which would normally end up in the wastewater. The facility delivers high quality wastewater by extracting organic content, which it converts into methane to replace fossil fuels. The GWE technology involved removes 80-90 percent of organic waste content, to give cleaner effluent while also reducing odour. “The wind doesn’t need to blow and the sun doesn’t need to shine to produce this green energy,” CST Wastewater Solutions managing director Michael Bambridge said. “It is a highly viable renewable in its own right, which complements the many excellent solar and wind energy sources suited to other projects. Ultimately, the Oakey plant will pay for itself with biogas, then go on to produce virtually free energy for many years after that,” he said. “Right now, the Oakey plant is delivering cost-efficiency benefits at a time when they are most needed, when the plant has to operate efficiently while coping with herd reductions resulting from the drought. Its success is clearly demonstrating the value in service of a technology that is widely applicable to the food, beverage and primary processing industry,” Mr Bambridge said.